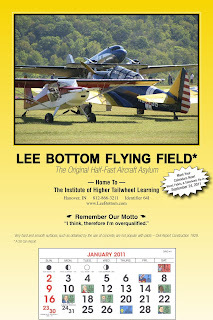 Have you seen the latest Lee Bottom Calendar? If not, look for them hanging in hangars, offices, and homes of friends near you. 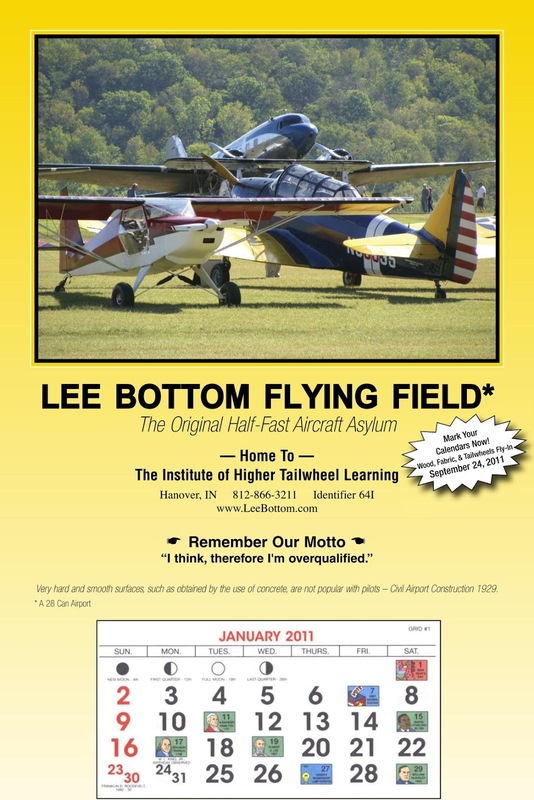 Each year, we produce only 1500 of these old fashioned calendars and they go out to Lee Bottom Family members based on a specific set of rules. Primarily though, these go out to people who have visited one of our events. 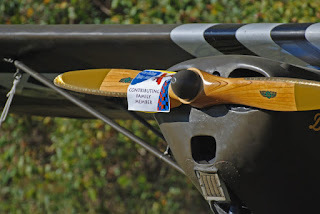 The few that go elsewhere are people who have done something great for aviation, or who have gone out of their way to support our cause; survival of the airport. If you didn’t get one, the next time you visit one of our events make sure you register. Again, this is the primary way to get one. Now in their 25th year of existence, they have developed a real following and earned somewhat of a collectable status. If you have never received one, the calendars are produced in the shape and size of gas station calendars of years past. The only thing that changes is the annual airport motto and the single photo. Despite only two changes per year, the effort involved in choosing them holds up production every year. We start looking at photos in October and find ten to twenty we like; the goal is to find a picture that speaks for our airport. Then we cut them out, clip them to old calendars, hang them on the fridge, and walk by them over a few days to see which one stands out. Almost always, by using this method, we find one that is an obvious choice. This year that wasn’t the case. It came down to a tie. As you can see, these are wildly different yet they both speak volumes about our airport. Through the years, we have developed a great airport family and because of this we really loved the Taylorcraft photo. 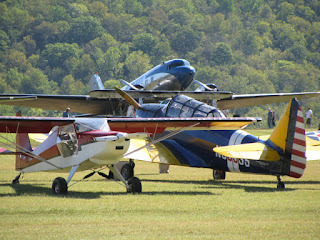 But ultimately, it was the multi-aircraft photo, the bottom of the two, that won. 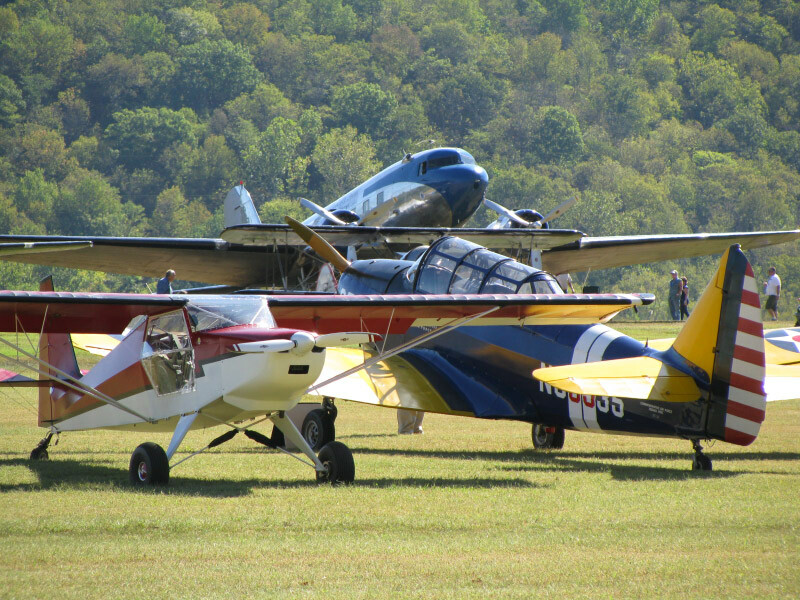 Knowing many people other than the calendar owners would see them, we wanted people to look at it and see the great cross section of aviation represented at our field. As for the motto, it was an easy choice. The level of thinking on this planet seems to be decreasing every day and we believe this motto will ring true for the members of our airport family. Or course, there is one other thing about these calendars that is important; fund raising. As the events and airport have grown, so have the expenses involved with keeping it alive for all to enjoy. Along with each of the calendars comes a donation card. Last year, your donations allowed us to purchase fuel for mowing the runway, tractor repairs, an aerator for the grounds, a tram for events, grass seed for land hard hit by drought, a new windsock, and numerous other items like grease, mowing blades, and equipment tires. If you like what we do here and you want to see it continue, we hope you contribute to the airport operation fund. Every cent goes back into the airport. If you didn’t receive a calendar and you would like to contribute, you can also go to our website and do so there.